Use to start a discussion or unit about various sources and types of CO2 in the atmosphere. This video helps debunk the misconception that volcanoes emit more CO2 into the atmosphere than human activities. Humans emit far more CO2 into the atmosphere than volcanoes. If needed, students can review fossil fuel formation in segment 3 of this same set of resources. Penn State climatologist Richard Alley describes how we know that most of the carbon being added to the atmosphere in the last century is from fossil fuels. Alley explains that by measuring the different carbon isotopes and the changes in carbon compared to oxygen, we know how much carbon is added to the atmosphere by living organisms and volcanoes (small) compared to that added by burning fossil fuels (large). 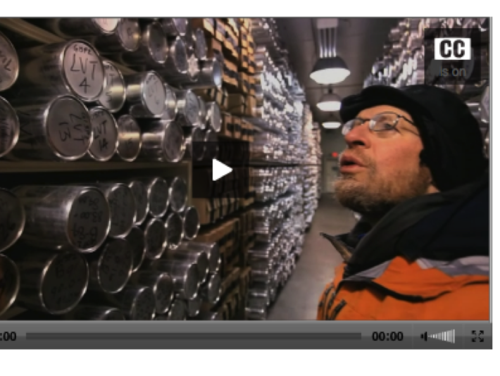 Comment from expert scientist: The video and the corresponding student activities are useful show how scientists know that the rise in CO2 is due to burning of fossil fuels, rather than natural processes. Richard Alley is a dynamic personality and does a good job presenting the science in the video. Below the video, there are four different activities that teachers can use follow up on the concepts presented in the video. Audio track is augmented by word track running along the bottom. Teaching tips, learning objectives, and an annotated script are included to facilitate the use of this resource in classrooms. This segment is from the hour-long episode but stands alone quite well. Richard Alley is a well-known climate scientist and an engaging presenter.